Continuing my description of the trip to the Bellarine Peninsula…. So, where was I? Ah, yes, the Queenscliff town…. We might call ourselves lucky, as we finally found a good company to cycle with (hope that they enjoy our company as well :)). As winter with its unpredictable weather is coming, it is quite hard to plan ahead. So our latest ride was spontaneous - I’ve monitored the weather and the forecast was ‘sunny with no rain’, called out our friends, discussed all the details and, here we are, ready to cycle on the Bellarine Peninsula Rail Trail from Geelong to Queenscliff (~32-36kms, depending on where are you going to start). The Bellarine line was opened from Geelong to Queenscliff in 1879 to carry soldiers and materials to assist in the defence of Port Phillip Bay from possible attack by the Russians. It also carried holiday makers to the popular seaside resort of Queenscliff. The line was closed in 1976, but the section from Drysdale to Queenscliff was reopened as a tourist railway in 1981. It officially became a rail trail in 2000. The Bellarine Rail Trail follows the historic old railway line between Geelong and Queenscliff. 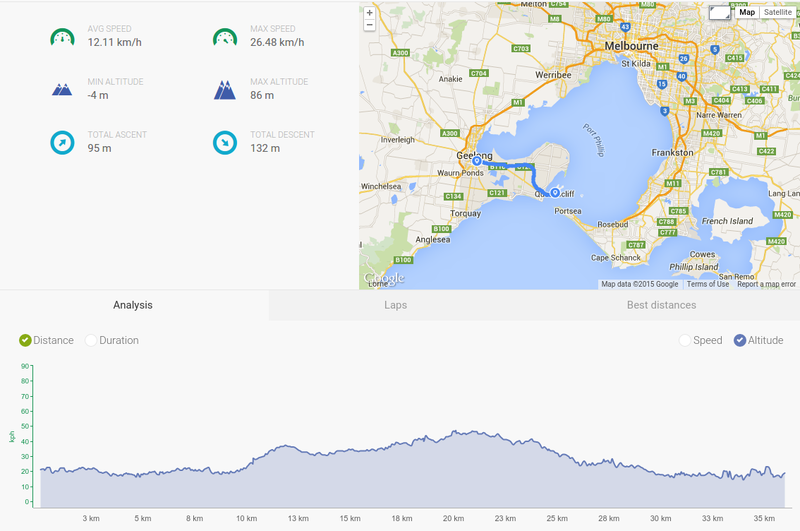 According to ‘official’ information, it's 32 kilometres long (in fact we rode ~36kms). The trail is mostly sealed while some parts are firm with a gravel top. It is mainly flat, with some short, steep climbs up from Leopold toward Curlewis and Drysdale. We started our ride in Geelong and finished in Queenscliff. As we’ve already visited Geelong and Queenscliff, could focus on the trail itself and don’t worry that we came so far and haven’t seen anything around. First part from Geelong to Drysdale, where we had a break, is not so scenic as the other part from Drysdale to Queenscliff. (Please note that there are not many options of cafe or other eating places on the way. Even at Drysdale, which lies right in half way of the trail and has the old railway station for visiting, the kiosk has only chips, ice-cream and instant coffee. Wish I knew that as initially I thought that we will buy something for lunch there. Luckily we took some snacks and fruits with us). Surprisingly most of cafes were closed and the town itself was empty. Yep, I’ve almost forgot that feeling when you arrive to the small town late and have nowhere to go to except fish-and-chips place… Anyway, thanks to Urbanspoon and Tripadvisor, we found a nice place to have a nice dinner and do not spend a fortune. If you decide to ride this trail, the related links list (see on this page) give you more information. If you plan to ride the full length of the rail trail, you can start at Queenscliff train station or at the other end at South Geelong station. If you take the train from Melbourne, the nearest train station is 1 kilometre away at Carr St. If you are in Drysdale you will can start the trail at the train station, where the volunteer-run Bellarine Railway operates steam trains to Queenscliff and back every Sunday. Car parking is available here. You can even take your bikes on the train to Queenscliff and ride back (or vice versa). The trail itself is not so scenic as Murray to the Mountains Rail trail, but it is close to Melbourne, sealed and mostly flat. Hope that if you decide to ride it you'll enjoy it.